Collected my gorgeous yellow MINI yesterday and over the moon with it. So glad I found Tracey. Having had a near miss with a very pushy salesman elsewhere, it was great to deal with Tracey who was the total opposite - friendly, patient, and very helpful, even helping me with a query about a warning light on my daughter\'s MINI that she hadn\'t even supplied! I would highly recommend Tracey to anyone looking for their ideal MINI. I will definitely be going straight to Tracey when I\'m next in the market. Thanks Tracey, loving my little MINI - Brighter than the sun! What an absolute joy from start to finish! Honest, straightforward, friendly no nonsense service. Couldn\'t be happier with my car and the whole process Cannot recommend highly enough. Genuinely like buying a car from a trusted friend. I wish I\'d found Tracey sooner. We had been searching over 2 months and almost found the perfect one - when Tracey was on the case it soon became the perfect one with the fitting of a new interior and last minute change of wing mirrors. My mum is truly delighted and now excited to go back and see Tracey and get some alloygators fitted! I managed to drive my new MINI home on the same day. I would highly recommend Mrs MINI to anyone without hesitation. Tracey also promised my traded car would go to a good home as I was pathetically sad about letting her go. All round A1 service! About a year ago I was asked by my daughter to spend her money and buy her first car. I found Mrs MINI and Tracey sold us a lovely MINI One 7 which my daughter absolutely loves. This year my son asked me to do the same for him, so my first call was to Mrs MINI where Tracey had the perfect MINI One which we collected yesterday. James is delighted with his purchase. As ever Tracey has made certain it was in perfect condition for him. Thanks Tracey. I would highly recommend Mrs MINI to all. Tracey has returned all phone call and emails promptly- a big thank you to her. I am over the moon with my new MINI, I explained what I was looking for and Mrs MINI found an exact match for my requirement and was very good helping me stick to the budget by exceeding my expectation. I had an issue where I got confused by a light and Mrs MINI was very happy for me to be in touch and help. Mrs MINI took time to explain the intricacies of the MINI. 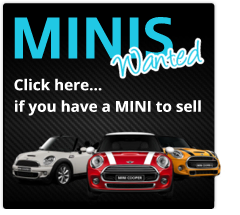 Thank you, I will definitely keep in touch for any MINI needs that come up. Alloygators fitted this morning excellent service thank you very much. Brilliant service from start to finish.. Many thanks Tracey for helping me choose the perfect MINI so happy with it.